Forest Garden 4 x 3 Overlap Pressure Treated Apex Shed: This shed has been factory pressure treated to give it a long lasting rot free finish which is guaranteed for 15 years. This shed has a traditional apex roof which will suit any location in the garden whether it is next to another building or standing alone in the garden. This shed has an OSB sheet material roof and a pressure treated boarded floor to provide a durable and rot free surface. This garden shed is ideal for smaller gardens for general garden tools and has a single door with supportive Z frame and no windows for added security. The timber is sustainable sourced and FSC certified for peace of mind when purchasing this shed. The door of this shed has hidden hinges and a hasp and staple lock for further security benefits. 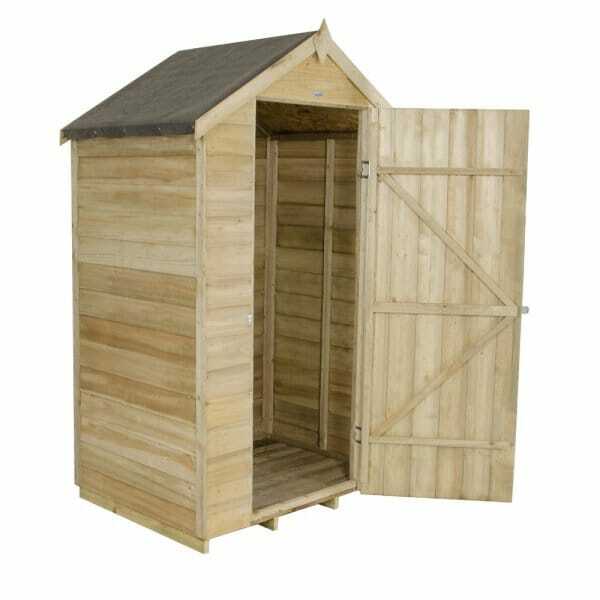 This wooden shed is delivered in easy to manage sections and requires simple assembly. NB: This Timber has been pressure treated in the factory which will give the wood a darker appearance. The Shed is guaranteed against rot and fungal decay for 15 years – there is no need to treat it once erected.